I have collected some links with detailed information about intonation and positioning of the bridge and nut. 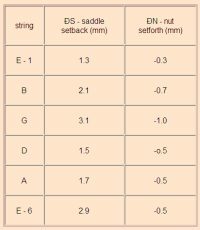 Calculating Intonation Correction - On this page you can find a detailed description of the corrections for the position of the bridge for guitars. The size of the correction is calculated with an electronic tuning device. This method might be adopted for the mandolin. On this page in German the intonation of a guitar is described in detail using corrections for the bridge and the nut. By this method a very clean intonation is possible. First the bridge is positioned to have the same correct intonation for the first fret and the 12th fret. Then the nut is corrected to get the right intonation for the open string. Gregory Byers is a builder of guitars. He has made a lot of research about the right intonation of a guitar and other stringed instruments. A detailed paper with his results can be downloaded from his homepage. my pinboard links about intonation and positioning of the brigde and nut - I will add new links here! It is obvious that for the perfect setup bridge and saddle have to be corrected. The first step should be to setup the height of the bridge to get a proper action. A lower action requires a lower compensation, a higher action requires a higher compensation. Before you begin to make changes to the setup you should check the intonation with an electronic tuner with new strings. You should check the differences of the tuning for different fret positions. Tune the open string exactly and check the tone on the different fret positions. If all the fretted tones are too high or too low on all the strings a correction of the bridge position is possible. This should be the normal situation. Try to estimate how much you need to correct the position of the bridge for each string and decide in which direction you have to move the bridge. To move the bridge to the correct position compare the tone on the 2nd or 1st fret with the tone on the 12th fret. The tone on the 2nd fret should be 100% in tune, then check the tone on the 12th fret. If this tone is too high you need to move the bridge in direction away from the soundhole, if it is lower than expected you have to move it into the direction of the soundhole. You should always lower the string tension of the strings when moving the bridge (at least a little bit...). As a result of this setup the tone on the 2nd fret and on the 12th fret should both be exactly in tune. Finally you should also check the open strings. If the position of the nut is correct the open strings should be in tune too, if not it might be necessary to have the nut setup by a experienced luthier.